Let’s face it OnePlus has made a mark in the industry and is one of the fastest selling smartphone brands in India. The company also has the biggest fan following and much of it is loyal. The fan base has been made on an excellent program of invitation only purchase, which worked wonderfully. The tradition continues to linger on, though not on the smartphones but on some of the products like the latest OnePlus backpack. The newest smartphone to come from the firm is the OnePlus 6T that has both – beauty and brains. We tested out the device for a while to understand what makes it tick. This is our review of the OnePlus 6T. The “T” version of any OnePlus smartphone is mostly a facelift version of the actual form. But that is not the case with the OnePlus 6T. Yes, it does come in the Midnight Black and Mirror black colour options, but it has its own distinct features that sets it apart. For starters, the OnePlus 6T has a 6.41-inch optic AMOLED display with 19.5:9 aspect ratio, supporting screen resolution of 1,080×2,340 pixels. Corning Gorilla Glass 6 is on top of it for that much needed protection. The notch has been narrowed down to a waterdrop design and the ear speaker has been moved to the extreme top part of the smartphone. The chin has been reduced and overall the display does seem be edge to edge (well, almost). 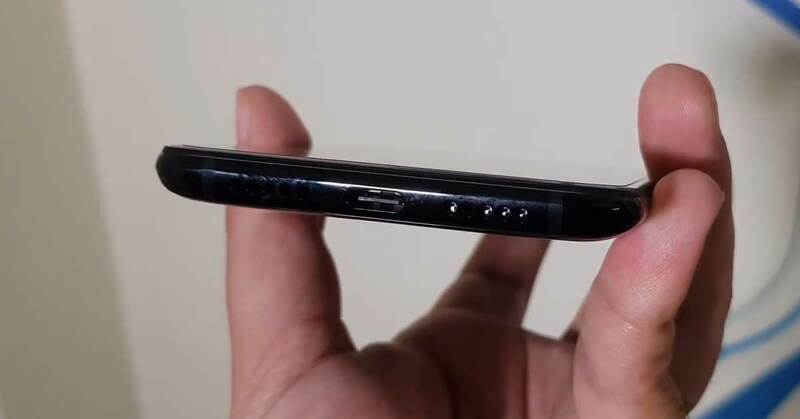 The fingerprint reader has also been moved from the back and placed on the front. It is located under the touchscreen’s bottom part and is quite delightful to work with, especially after the new update they rolled out a day ago. Setting it up was also child’s play. IT comes with three different animations too, so that user always known where he/she is pressing. As for the other aesthetics, the power and the ringer button are on the right, and the volume rocker button along with the 4G ready SIM card tray is placed on the left. The bottom part has the MIC and loudspeaker grille along with the USB type C charging port. Flip the phone around and you are greeted by a seen before Mirror Black rear panel, which still is a smudge magnet. However, we are not deducting points here as most smartphones in the category are a fingerprint attractor. 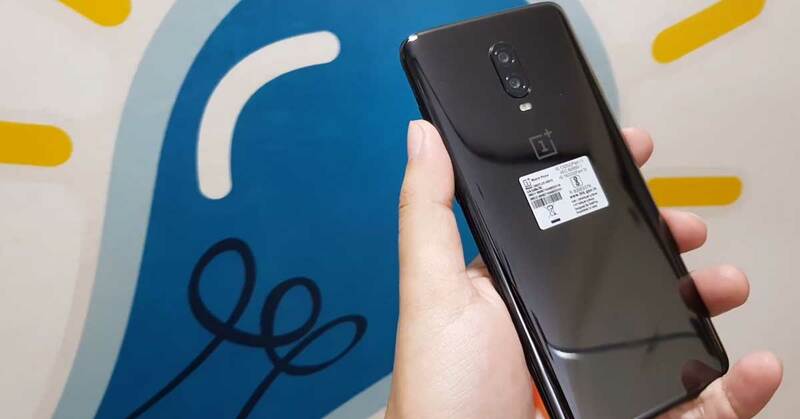 The twin cameras also play house on the rear panel with the dual tone LED flash and OnePlus branding under it. The back panel is curved and pushes into the sides, which enabled us to grip the smartphone better. Coming back to the display the screen is great as one can be. We played a lot of YouTube videos and games on it and not once did we feel the display going out of sync or loosing sharpness. HD videos ran really well on it and we were quite happy with the results. The reduced notch did allow us to enjoy videos better since the it does not get too much from the side where the notch is placed. 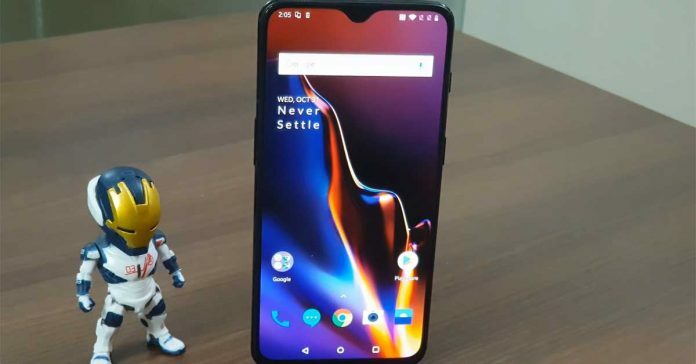 Under the bonnet the OnePlus 6T is not a significant upgrade, but does give the users what is needed from a premium smartphone. The performance is now slightly better as this smartphone comes with Android P right out of the box with the latest Oxygen OS on top. Incredibly the OS layer on top of the Android P does not slow it down and keeps everything smooth. It is a lovely UI experience on the OnePlus 6T as not once did the system lag on any of the homescreens or when we quickly drew the app drawer. The animations are smooth and apps open in a jiffy. Yes, the OS does come with its set of bloatware, but nothing you cannot get rid of swiftly. Overall, the smartphone uses the new Android OS to its full potential. Above that, the users get OS upgrades for the next two years and security updates for three years. Inside, the OnePlus 6T is powered by the same chipset combo you get on the OnePlus 6. The 6T comes with Qualcomm Snapdragon 845 quadcore chipset, too. The users have three RAM and storage combinations to choose from. These include 6GB RAM/128GB storage, 8GB RAM/128GB storage and 8GB RAM/256GB storage options. The one that came to us for review was the 8GB RAM with 128GB storage version. Which we felt is the right combination. You get good amount of RAM for everyday processes and the right amount of storing capacity to go with it. Moving on to the cameras, there are few upgrades now available to the system. Let’s start with the rear cameras first. 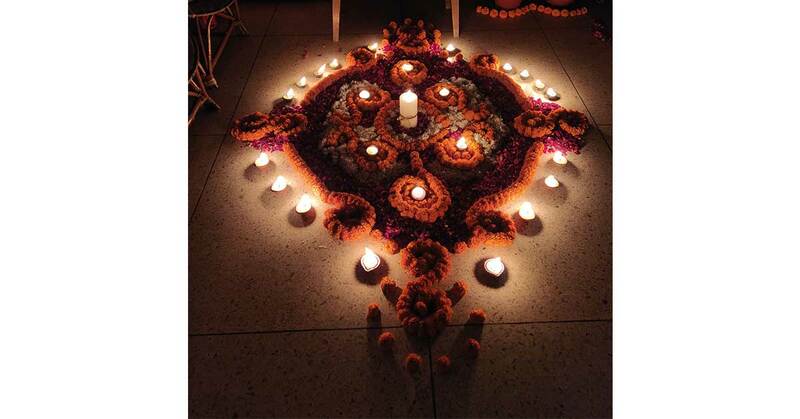 Powered by a 16 MP + 20 MP sensor array, which has an aperture size of 1.7. The cameras now are able to take better pictures in low light and night thanks to the Nightscape mode. We found the picture sharpness to be much better than the OnePlus 6 on this smartphone, when clicking at night. For really dark places, we suggest to keep the flash on, which will get you even better sharpness when capturing humans or nearby objects. Studio light mode has been added too, to the OnePlus 6T which does a job of highlighting the subjects face in the images. The selfie camera has been shifted to the middle of the screen, which makes it slightly better to take photographs with. Powered by a 20MP sensor with aperture size of 2.0, auto HDR is available on the front camera, just like it is available on the rear ones. Sadly, the night mode is not available here, which we were hoping to see, as the night bird in us would have loved to take selfies using that. Nevertheless, the front camera does a good job when it comes to day and low light selfies. Though at night you do see a bit of colour loss and pixelated edges in the photos, but nothing to be ashamed of. When it comes to gaming and running power hungry apps on the OnePlus 6T, this smartphone is one of the best on the Android platform. We ran games like Asphalt 9 on it and boy-o-boy did it play well. The smartphone did warm up a little during this time. The sound experience is also nice just like what we heard on the OnePlus 6. The thuds and thumps are clear on the loudspeaker, however the resonance is even better on the USB type C OnePlus earphones (sold separately). So, you might want to pick one of those in case you like watching Netflix shows or lot of YouTube videos on your mobile. In case you have a 3.5mm headphone you can still use them with this mobile. Since the OnePlus 6T does not come with a 3.5mm audio port the company does supply its customers with a USB type C to 3.5mm adaptor in the box. OnePlus 6T has also seen a battery bump. It is now at 3,700 mAh. This extra bit makes it last for even longer than a day. And our usual day consists of light gaming, a lot of phone calls, YouTube videos et al. All of it on a 4G networks with WiFi enabled. For us it lasted for more than 24 hours and in most cases we were not charging it at night, but fast charging it with the supplied charger and cable in the morning. So, 80-85percetn charge was good enough for it to last till the next morning and more. We found the call quality on the OnePlus 6T to be much better than what it was on OnePlus 6. It is louder and crisper. Same is the case when talking using the loudspeaker. Other features of the OnePlus 6T include WiFi 802.11 a/b/g/n/ac, Bluetooth 5.0. A-GPS, Adreno 630 GPU, 4K video recording (which comes out to be very close to life during the day time), NFC, Gyro and proximity sensors. On the assessment bench the OnePlus 6T got 8,922 points on Geekbench 4 multicore CPU test and 14,077 points on its compute test. Both indicating high-end performance. Transferring all our data from the OnePlus 6 to the OnePlus 6T was super easy. Just use the OnePlus switch app that is already available on it, select the things you want to transfer and within minutes you will be up and running on the new smartphone. Yes, some apps required downloading them again, but the rest of the data was intact. We had a gala time with the cameras as well, especially in the night. But, what troubled us the most is the price bracket OnePlus is taking its new version of smartphones to. They are now playing in the 45k – 60K category where they will be up against big players likes Samsung and Apple. We still feel that the sub-40K market is best for OnePlus. However, times do change quickly. Will it still be the highest selling premium smartphone in India? We shall get to know in a quarters time. All in all, if you can spend a little over 40K and are looking for good cameras and excellent performance from an Android smartphone then the 8GB RAM with 128GB version of OnePlus 6T at Rs 41,999 will do you right.